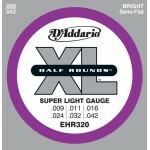 Gauges 09-11-16-24-32-42. World-renowned as "The Player's Choice" among guitar players of all g..
D'Addario EJ27N Classical Guitar strings are great for beginners and students. 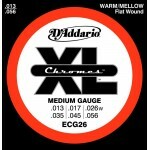 The set contains 3 ..
Gauges 10-13-17-26-36-46. 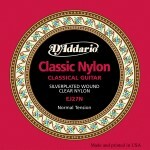 World-renowned as "The Player's Choice" among guitarists of all genre..
Gauges: 10-14-23-30-39-47. 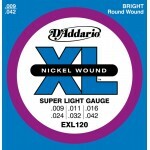 Made by the world's largest string manufacturer, the..
Gauges: 8-10-15-22-30-39. 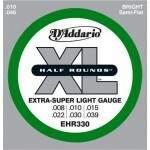 D'Addario EHR330 Extra Super Light Electric Guitar Strings feature a he..
Gauges: 9-11-16-24-32-42. 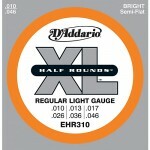 D'Addario EHR320 electric guitar strings feature a hex steel core and c..
Gauges: 10-13-17-26-36-46. 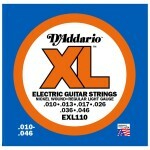 D'Addario EHR310 electric guitar strings feature a h..
Gauges 13-17-26-35-45-56. D'Addario Chromes Electric Guitar Strings offer a smooth feel and great..
D'Addario Chromes Flatwound electric guitar strings are famed for their smooth feel and warm, mellow..
Gauges 11-15-22-30-40-50. 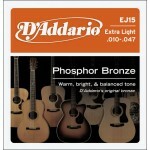 3 polishing steps produce an incredibly smooth finish on D'Addario Chro..
D'Addario Chrome Extra Light Electric Guitar Strings are revered for their warm tone and ultra-smoot..